Whilst we tend to think Japan is the current "Asian boxing super power" it's fair to say that they have historically been given a great run for their money by the Philippines which seems to churn out top fighters year after year as if they have a conveyor belt developing talented young fighters. The next man on that production line appears to be the exciting and criminally under-rated Genesis Servania (27-0, 11) who appears to have developed into a highly popular and hugely talented young fighter. 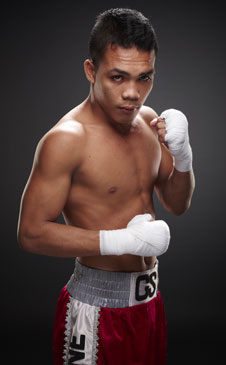 Aged just 24 Servania is one of "the new generation" of Filipino fighters, the ones that have clearly been inspired by the likes of Manny Pacquiao and Nonito Donaire who would have been making their name whilst Servania was just a teenager. Despite the obvious inspiration Servania is no copycat of those men and appears to want to be his own man in the ring, an admirable quality for one as young as he is. Despite his age Servania is fully fledged man in the ring with plenty of experience already including fights with numerous world level opponents. Despite being young he is no longer treat with kiddy gloves and is instead a fighter who is put in with genuinely top level fighters whilst moving himself onto the verge of a world title fight and a chance to emulate the great Filipino fighters over the years. Unlike many top prospects Servania never had a long amateur career. Instead of learning his trade with years spent in the unpaid ranks the youngster began his boxing journey the intention of turning professional very quickly and from interviews it appears Servania only fought in a handful of sponsored amateur tournaments. Like many in his homeland he came from a poor family and the need for money just to eat was massive. An amateur career would have meant more struggles for the youngsters family and the decision to become a professional fighter was one made almost from circumstance as much as choice. The short amateur career that Servania did have was enough to convince ALA Gym that he was worth signing professionally and in February 2009 Servania made his professional debut at just 17 years old. On debut Servania made light work of fellow youngster Mike Espanosa, scoring a second round KO. By the end of 2009 the young Servania had advanced his record to an impressive 6-0 (3) and had already moved on to fighting in 6 rounders. He was still fighting limited opponents, like most young prospects, though he was developing quickly and showing the poise and patience of a fighter who could really go a long way in the sport. Of course there was still a whole world of work to be done but he was showing all the signs of a fighter with genuine world level potential. Having shown a lot of good qualities in his first year of boxing Servania was then given more testing assignments and actually began 2010 with an 8 rounder against a fighter thrice as experienced as himself. Most Olympic prospects aren't fighting 8 rounders in their 7th professional bouts but the belief was so strong with Servania that his manager felt the youngster had the talent to take the gamble with. The gamble of moving Servania up the the 8 round distance so early paid off excellently as he over-came Jun Piacidad over the distance. By the end of the year he had amassed a further 5 victories, all by decision, including two at the 10 round distance. His experience, in terms of rounds, was adding up quickly and he was learning more and more about boxing, himself and his opponents. As well as the distance of fights being stepped up so too were the quality of Servania's opponents. By now it was no longer a case of Servania winning mismatches but winning well matched and competitive contests with the likes of Alvin Makiling and Jestoni Pepito. This level of matchmaking was deliberately tough and it quickly saw fans taking note of the talented fighter who had moved to 11-0 (3) whilst still just a teenager. By now it was obvious that his promoters had a special talent on their hands and they seemed to know it. Rather than keeping Servania battling just domestic opponents a concious effort was made in 2011 to have him battling international opponents. There was little point in keeping him against opponents that he could beat with out issue and instead they tested him with former world title challenger Gerson Guerrero. This test was supposed to see how Servania would cope with a world level talent, even if Guerrero was shop worn and naturally smaller, and as it turned out Servania passed with flying colours winning a clear and decisive decision over the experienced Mexican. Following the victory over Guerrero it was decided that Servania should then continue to fight international opponents and his promoters then matched him with the then unbeaten Marcos Cardenas, another Mexican. Cardenas was dropped twice in the bout as Servania racked up another 10 round decision victory to end 2011 with a very impressive looking 16-0 (5) record. The international feel to Servania's opponents continued in 2012 and he kicked off the year by facing Nick Otieno from Kenya. Servania, having again proven he could go 10 rounds, then took the huge step up to fight in a 12 rounder against multi-time title challenger Genaro Garcia. Garcia, who had previously fought both Toshiaki Nishioka and Hozumi Hasegawa, had vowed to take the youngster to school though seemed to learn that the youngster was much better than anticipated. Instead of Garcia teaching the youngster a lesson it was the talented Servania who taught Garcia a lesson and forced a final round stoppage after Garcia had been dropped twice. The Garcia fight was easily the toughest in Servania's career up to that point and was a genuinely good test. The scorecards, which were all close, showed the competitive nature of the bout though in the end there was no real complaints about the stoppage as Garcia's trainer seemed to climb in to the ring at the same time as Bruce McTavish waved off the bout. Going in to the Garcia bout ALA's leader Michael Aldeguer had said he wanted to see what Servania was made of. It appeared from the fight that he was made of something special and although the bout was tough there was no longer any doubting what Servania could do when he was switched on. As well as the impressive victory Servania also earned a high WBC ranking and won the WBC International Silver Super Bantamweight title. Servania would return to the ring just 2 months after the hard bout with Garcia and fight in a second successive 12 rounder, this time against Jorge Pazos in a bout for the WBO Asia Pacific Super Bantamweight title. This time Servania would have to go the 12 rounds though he did drop Pazos numerous times and was a clear winner as he took his first 12 round decision and moved to 19-0 (6). By the start of 2013 some fans outside of the Philippines were starting to take note and several of them had began to tip Servania as a future world champion. The only question mark they had about the youngster was regarding his power. He had stopped less than 1/3 of his first 19 opponents and many wondered whether his lack of power was going to prevent him moving on to the next level. In 2013 however Servania began to develop real power. His first fight of the year saw him stopping the teak tough Indonesian Angky Angkotta in 7 rounds, becoming just the third man in history to stop the Indonesian "Time Bomb" who had beaten the likes of Donnie Nietes, Rocky Fuentes, Sonny Boy Jaro and had gone the distance with AJ Banal and Jorge Arce. Whilst the stoppage over Angkotta was impressive it was merely the icing on the cake of a punch perfect performance by Servania. He had beaten up and broken down Angkotta with lovely uppercuts, crisp counters and just a dominant display of skill. Servania would follow up the victory over Angkotta by stopping another Indonesian, Isack Junior. Junior was stopped in 3 rounds from a hard body shot which would later lay the plans for Albert Pagara to stop Junior in a round, also with a body shot. Although Servania had impressed in a number of his bouts he had never fought away from the Philippines. That changed in July 2013 as he travelled to Macau to fight Japan's charismatic Konosuke Tomiyama on the undercard of a Zou Shiming card. For whatever reason Servania seemed to ignore his boxing skills and got involved in a genuine tear up with Tomiyama that resulted in one of the best opening rounds seen in recent years. The first round of the fight saw Tomiyama dropped within 30 seconds, less than 90 seconds later Servania was dropped and just before the round finished Servania was dropped for a second time. Fortunately for Servania he managed to regain his poise and dropped Tomiyama in round 3 before taking a technical decision in what was one of the most memorable "Macau" bouts of 2013. Unfortunately though it did seem like Servania was trying to put on a show rather than do what comes naturally to him and box. Of course the war did lead to fans internationally paying more attention to him which may well have been the aim of the bout given that it was by far his highest profile contest. Just 3 months after the Tomiyama bout Servania returned to face Panama's Rafael Concepcion. Concepcion, best known to Filipino fans for stopping AJ Banal and giving Nonito Donaire a particularly tough bout, was no match at all for Servania who only needed 2 rounds to finish the job and claim the WBO Inter-Continental Super Bantamweight title. Having taken out Concepcion with such ease and scoring his fifth victory over a former world title challenger Servania then took on his first former world title challenger in the form of big punching Venezuelan Alexander Munoz. Munoz, although past his best, proved to be no match for the younger, swifter Servania who landed counters at will. Munoz, to his credit, tried to land his dynamite power though he was unable to time the speedier fighter who slowly broke down Venezuelan en route to a 12th round stoppage. Servania added another stoppage win when he forced Jose Cabrera to retire between rounds 9 and 10 in a bout on Pinoy Pride 27 in Dubai. The bout saw Servania suffering with cramps mid-way through the bout and it seems like the Filipino fight may need to consider a move up in weight. The move in weight however didn't come immediately and instead Servania continued at Super Bantamweight where he notched his latest win, a decision victory over Mexican foe Juan Luis Hernandez. That performance wasn't too impressive but was another win and showed that Servania can do the important thing, win, even when he doesn't look sensational. He has since fought just once, making an outing in Japan late last year where he beat Hendrik Barongsay to end a 10 month break from the ring. With his record now standing at 27-0 (11) and 5 stoppages in his last 8 bouts Servania seems to be showing that he is developing power as he matures both as a man and as a fighter. At just 22 he is a still a baby in the boxing ring though, as his opponents have found out, he is a skilled and gifted fighter who can beat much older and more experienced men with out too many issues. Interestingly Genesis is one of three, that we know of, fighting brothers. His older brother Jake retired a few years ago with a 5-1-1 (1) record whilst younger brother Rolando is a burgeoning prospect himself with a 6-0 (2) record. Whilst Genesis was inspired by Manny Pacquiao he wasn't blessed with the same natural traits. He wasn't born with thunderous power or lightning speed but instead Genesis has become one of the top Filipino prospect via his dedication to the craft his ability to think on his feet and his educated counter punching. He would see like the ideal fighter for any youngster, including his brother, aspire to be like. For those who haven't seen Servania we've included his fight with Concepcion below which ends with a genuinely impressive KO, and easily the best of Servania's career so far.